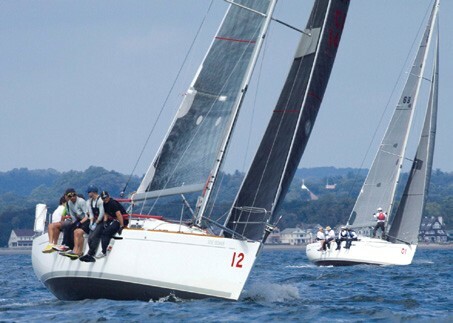 The 2014 Beneteau First 36.7 North American Championship was hosted at Black Rock Yacht Club in Bridgeport, CT September 18-21. Twelve races were held in the first national championship hosted by BRYC in many years, in winds ranging from seven knots and smooth water to 20+ with steep chop. After transiting from Ontario down the Hudson River to the event on Long Island Sound, Richard Reid’s Zingara (Port Credit, ON) scored six bullets to be crowned North American Champ, his third victory in this event. Winning five of the last six races, it was easy to see that Richard and his crew had dialed up the speed sailing to a convincing victory. Hailing from City Island Yacht Club, William Purdy’s Whirlwind (New York, NY) finished second only five points off the pace, with the third place trophy going to John Hammel’s Elan (Arlington, MA), representing New York Yacht Club. Excellent race management in shifting winds was orchestrated by Ray Redniss from Stamford Yacht Club. Ray is a much sought after PRO at many top shelf events, and his experience showed in keeping all race operations running like a Swiss watch. Regatta Chair Mike Cooleen worked for months to organize this event, which included 11 boats from fleets in the Northeast and Reid’s Zingara from Canada. Northeast Fleet Captain Junius Brown, skippering Resolute (Ridgefield, CT; Saugatuck Harbor YC) and Bob McHugh, Past Commodore of BRYC and skipper of Rambunctious (Fairfield, CT) were the driving force behind bringing this event to Long Island Sound. The racers enjoyed excellent hospitality and solid racing, from the first crew weigh-in at BRYC to the tapping of the last keg. Andreas Josenhans of North Sails (a multiple class World Champion) and his North Sails Regatta Services team shot video of each race and drew a large crowd once the racers were back on shore to view the action up close. The racers enjoyed these critique sessions, with Andreas providing helpful suggestions on speed and tactical improvements from his lifetime of winning big championships. Most boats raced with between eight and 10 crew and soon found out that weight placement, keeping extra weight out of the cockpit and keeping those on the rail tightly packed made a big difference in speed. The top boats put on a show of spinnaker handling and driving upwind in the chop when the wind showed some teeth on Saturday morning. The Beneteau First 36.7 has proven to be a competitive racer in both one-design and PHRF events on both coasts. In 2008, Julien Dougherty’s First 36.7 Tenacious beat a highly competitive field in the Newport Bermuda Race and took home the Gibbs Hill Lighthouse Trophy. The 2015 Beneteau First 36.7 North American Championship will be hosted by Bayview Yacht Club in Detroit, MI with racing beginning on September 11. Results of the 2014 NAs are posted at YachtScoring.com.